Environmental Systems, Inc. (ESI – now CBRE|ESI) helps companies make smart decisions about smart buildings. The Brookfield, Wisconsin-based technology and services firm pulls data from sensors and controllers in its clients’ buildings and feeds it into sophisticated analytics engines to identify issues, equipment, and processes that are not performing as expected or that are performing in an inefficient manner. Their engineers take the top anomalies identified, prioritize them based on cost impact to the business, and diagnose the issue. That combination of information and experience drives actions for improvements in efficiency, corrections, or dispatch of onsite service, which results in savings that drop to the bottom line. “We’re not selling a shiny box,” says Paul Oswald, President of CBRE|ESI. “We work with our customers to develop solutions that make their buildings run better.” CBRE|ESI’s customers span all vertical markets. Each has unique needs. Some are concerned mainly with cost reduction, while others have specific sustainability goals. CBRE|ESI consults with each customer individually to design a customized analytics solution. There was often a ‘disconnect’ in the sales cycle when the solutions and engineering were required to create the customer focused solution and the current platform did not lend itself well to well organized information, searchability, or collaboration. There were similar challenges at the administration and invoicing level as information was sometimes duplicated or in a location that fell out of alignment with a standard. Several attempts were made on former platforms to better standardize the information, but the disconnects led to many file structures and systems being developed as allowing additional redundancy and handoffs to occur. Over time, CBRE|ESI recognized that this potentially inaccurate information would build up, become extremely overwhelming, and would compromise the ability to find specific files and trust that the content was correct. 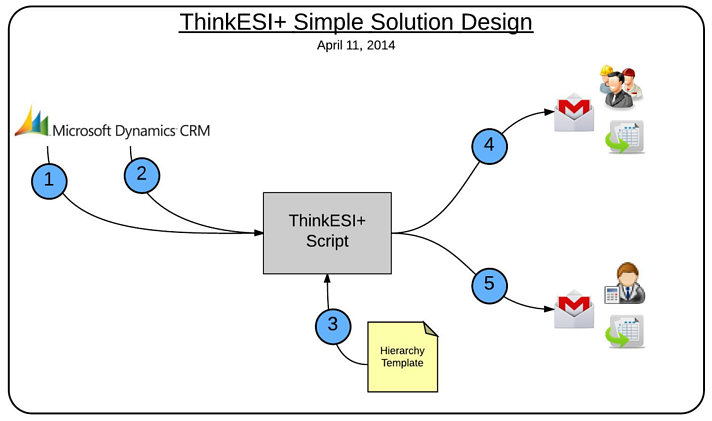 The ThinkESI+ system allows CBRE|ESI to improve their workflow, from sales to engineering to operations, by automating the sales hand off process to improve communications, standardize documents, the location framework, and make it extremely easy for all departments to find the information they’re looking for at any given time. This sales workflow is based on automation. When changes are made to ‘stages’ in the Customer Relationship Management sales cycle, the information is linked together to kick off a Google Cloud process that automatically generates a folder and file hierarchy in Google Drive. These folders and files are based on standard templates with standard places/destinations located within the Google Drive file system. When this hierarchy structure is generated, the folder and file names are automatically ‘merged’ with data from the Microsoft Dynamics CRM system to ensure consistent file and folder naming conventions. This makes it easy to find client data, have consistency across documents, and to have a common place for sales, engineering, operations and finance to store and collaborate on those documents. In CBRE|ESI’s CRM system, when the ‘stage’ field is changed to ‘Engineering Estimate Requested’, a script runs (via Google App Script), which generates a new opportunity within the customer’s specific folder using the correct template. If the customer is a new customer, the script will also generate a new customer folder in the document hierarchy, and add the opportunity. When the ‘stage’ field is changed to ‘Closed Won’, a script is run (via Google Apps Script) to generate the full project hierarchy based on the Document Hierarchy template. If the customer is a new customer and doesn’t exist, the script will also generate the appropriate new customer portion of the hierarchy. There is a fixed location that is only accessible to the Google Service Account to store the Document Hierarchy (customer binder). Roles are set in this hierarchy and are read and applied to the copy of the hierarchy. There is a static substitution table for folder names, variables and role names. When the ‘stage’ is changed to ‘Engineering Estimate Requested’, an email will be sent to either an engineer or an engineering group to drop an estimate into the correct Customer Binder. That email contains a link to the folder to drop the estimate into. When the ‘stage’ field is changed to ‘Closed Won’, Finance and Operations are notified that there is a new client. What makes this application so valuable, is the fact that a simple change within the company’s CRM (potentially one click), creates every file and folder needed for that client, without any manual work. This process not only saves the company time, but also creates a level of organization that is incomparable to a process done manually. Google’s ability to search effectively empowers employees to quickly find what they need as some of the larger portfolio and complex sales cycles can take up to a year. 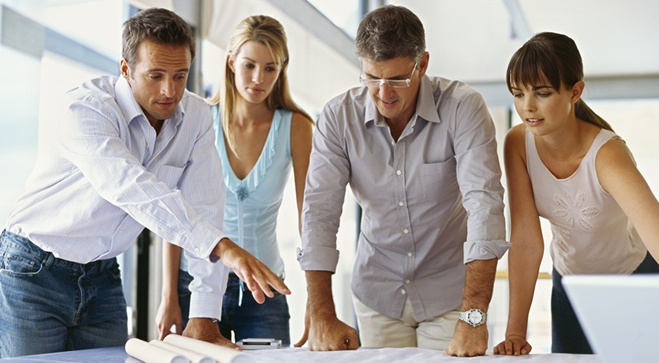 There’s a common structure and repository for all client and project related information. Using Google Drive allows CBRE|ESI to search in a highly efficient manner. Google Drive also enables remote workers, including those at client sites, salespeople on the road, or users at home responding to emergency situations, to have all the data available on any device at any time. The document hierarchy can easily be changed by an admin without the need for further programming. The organization has the ability to share and collaborate in real time over documents with internal people in remote locations or with customers. Leveraging Google applications “free” Google Doc formats wherever possible to hold the line on cloud storage costs as well as SAN storage costs, potentially extending the SAN lifecycle. Employees can track document changes in real time without a need for handoffs impeding the process. This system was a low cost, high impact custom solution developed for CBRE|ESI in partnership with Cloudbakers. The mashup of current MS Dynamics CRM, Google Apps Script, Google Drive, Google Hangouts, and Email allowed for simple adoption by only slightly modifying current processes to have an improved outcome. This was a lightweight addition to their organization. Instead of using an expensive full-featured document management system, CBRE|ESI was able to activate a simple, extensible solution to meet their needs and save on costs. This project truly shows the impact that two companies can have when working together.